Last month we announced we are giving away a 2-Day Off-Road Adventure to one lucky customer. You can enter to win as many times as you like throughout June simply by visiting Bob’s and filling out an entry form by coffee. The box will be emptied daily, so no double entries or you will be disqualified. Xplor-Int. is a MSF certified and AMA sanctioned off-road training facility located just a couple hours away in Western Pennsylvania. They offer a 2-day adventure that combines skill building taught in the Basic Off-Road Course with advanced techniques for single track and obstacles, plus outdoor survival skills and camping tips. You’ll ride for two days on a combination of dirt, gravel, and bedrock roads, and camp overnight. The last half-day is spent wrapping up the concepts and giving you time to pack. If you are comfortable riding at the speed limit on public roads, you are ok to enter the drawing. And if you have taken any kind of training before, there are still plenty of skills to be learned and/or perfected! The course enables riders to transition from the basics of off-road riding to the more complex techniques needed for multi-day trips on dual-sport machines. It teaches you skills that will enable you to transition from asphalt to double-track, single-track, and fire trails. You will also learn the fundamentals of straight lines, turning, body posture, and braking are combined to handle obstacles, stream crossings, and tight single-track. The course is intended to build confidence and break down barriers without destroying you and your gear. You will be presented with real-world challenges so you can assess terrain and risk, then make good choices using the skills taught to you by the instructors. Xplor-Int. 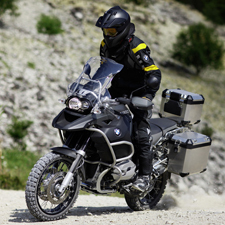 instructors have taken motorcycles into the world’s most challenging places, so you will learn from pros how to pack appropriately and manage your resources, as well as deal with emergencies. You’ll learn how to pack right, and how to ride your bike fully-loaded. There are regular breaks throughout the day, and two breaks for meals each day which are cooked onsite. You’ll start riding at 8am and finish by 6pm, break for dinner, then continue with strategy sessions and a night ride.